Manual Physical Therapy is skilled soft tissue mobilization, joint mobilization and/or neural tissue mobilization in order to create mobility, restore tissue health and optimize functional movement. Specific hands-on techniques use pressure, kneading and manipulation to dramatically improve range of motion and healing of injuries all over the body. Our therapists are experts in manual therapy techniques developed from international and American institutions such as the Folsom Long Term Course, Maitland-Australian Physiotherapy Seminars (MAPS), the Institute of Physical Arts (IPA), and many others. Graston is the implementation of stainless steel instruments for soft tissue assessment and treatment that can speed up recovery. Through the use of these tools, major and minor fibrotic changes in your soft tissue can be identified and treated efficiently. ICE, or Ice, Compression and Elevation, is still a favorite method of reducing pain and swelling. However, we use technologically advanced devices, such as the Game Ready units, which provide both cyclic pneumatic pressure and ice simultaneously. Most people are unaware of their posture, yet if you are walking, standing or sitting crooked, all your joints will suffer. Over time, your bad posture can cause injury and chronic pain. A proper analysis for postural deficiencies and an individualized prescription for body realignment can be a powerful tool for conquering pain. Chances are you spend the majority of your time during the week at a desk. We provide ergonomic advice on workplace set up and we teach therapeutic exercises to prevent repetitive stress injuries and as well as neck and back pain, all while at your desk. Perhaps your style of running or walking has led to your pain or injury. We can observe and assess any abnormal gait and footfall pattern using a video analysis that can assess joint angle and capture still photos with positional vectors while you run or walk on a treadmill. We then devise a training program to correct the errors. Running without injury is one goal, walking without pain is another goal. Footwear adjustments and orthotics will be made at the time of the visit. Wearing the right footwear can sometimes be enough to reduce foot pain as well as ankle, knee or even back pain. However, sometimes you need a little extra help to make your foot more efficient. Orthotics are custom foot supports that are placed in the bed of your shoe to influence the function of the foot. A thorough evaluation by a physical therapist trained in orthotic fabrication is the best way to find out if you need orthotics. If you have been injured, whether it is due to a forceful trauma or just wear and tear over time, your body looks for a way to compensate. This compensation leads to imbalances, overuse of an uninjured limb and overall dysfunction. Below are a few videos showing therapeutic exercises. The exercises prescribed are individual to the person and may consist of stretching, strengthening, neuromuscular education, gait training and balance work to name just a few. Our aim is return our patients better than they have been in years. A sports test measures all the goals of fitness: strength, agility, balance, proprioception, cardiovascular/respiratory endurance, stamina, flexibility, power, coordination and accuracy. We use this to determine when you are ready to return to full sports. 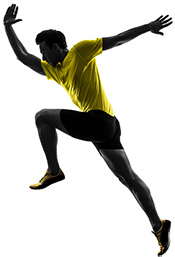 A series of balance and jump tests are performed on each leg in order to assess the involved leg versus the uninvolved. Once weaknesses are identified, we create a personalized program to return optimum balance and power.